I had a great experience racing the Smith Rock Ascent 50k in May. I ran fast, the course was conducive to my strengths, and I felt comfortable being out there alone (it is not remote and there are no big drop-offs or other scary parts that trigger my anxiety). 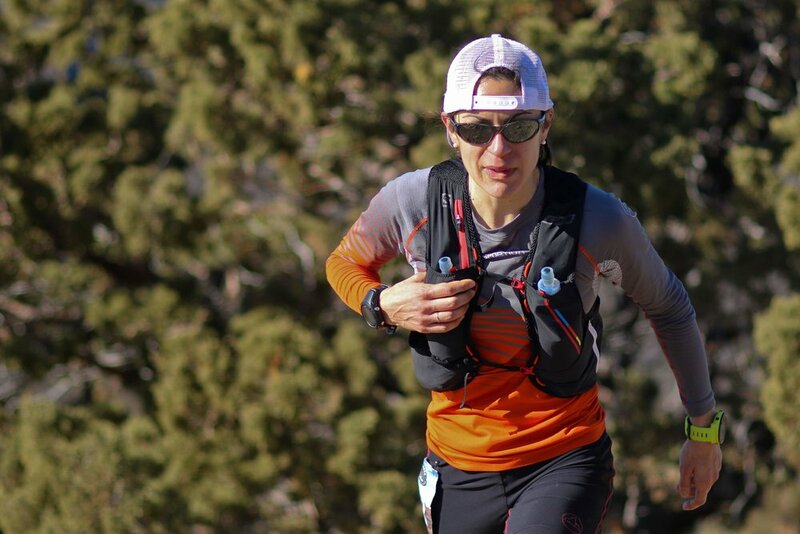 I loved the course so much that when I was looking for a debut 50 miler to close out my year and I found out that Alpine Running’s Run the Rock 50 miler was on most of the same trails, it was perfect. The Run the Rock course is two 25.5-mile laps with 7 fully-stocked aid stations with crew assistance allowed at half-way. Tad did some research and figured if I had a good race, the course record would be in reach as I had bested the the course record holder when we raced at the Chuckanut 50k two years ago. With some more research, Tad got splits off Strava and was able to compare those to my Smith Rock Ascent race. In general, we calculated that I could run 45-60 seconds slower per mile and I would be on pace for a sub 8-hour race if everything went well. Based on all that, we checked into travel logistics. We got cheap plane tickets to fly straight into Redmond, Oregon from Seattle (avoiding a 9+ hour drive) and booked a cute AirBnb 15 minutes from Smith Rock State Park. Everything was ready to go. And then my body revolted. The past 8 weeks have been a running roller coaster of non-stop injuries, taking time off, trying to run, hours of rehab, acupuncture and strengthening exercises. Not only has this ride taken a physical toll on my body, but it has exhausted me mentally as well. One day all my aches would feel better and then they’d feel worse the next day or move to a different spot most likely due to compensating for the latest one that just popped up. It is hard enough to start any race but going into a distance that is 16 miles further than I have ever run without adequate training was really scary to me. If this happened earlier in the year, we would have forfeited the race and plane tickets so as not to jeopardize my remaining season, but because it is the end of the year and I planned on taking extensive time off afterwards, we decided to go. Also, because I had raced the Mt Bachelor 50k with the same issues and it had gone fairly well, we were pretty sure I wouldn’t be doing any lasting damage. I have been dealing with a high hamstring/glute issue for years and after running in the snow in January at the Orcas Island 25k it was more aggravated than usual and had started to cause knee pain on the opposite leg. Throughout the year, it would come and go but was getting much worse late in the year, to the point that I stopped doing any workouts at all within the last 8 weeks. The hammy strain would go away, then the knee would act up, then it was back to the hammy and the knee was fine, then they both went away, but some weird tendon thing on the outside of the knee caused me to completely shut down a run 1 mile in, then that went away and it was back to the hammy. We would go back and forth multiple times a week, the race is on, the race is off… you get the idea. Thankfully, with the expertise of my dream team at Prime Sports Institute, Warren Schick from Active Points Wellness, and Dr. Lockwood of Align Chiropractic, I felt able to make it to the starting line, so we decided to go and see how far I could get. We had no idea if I was going to make it 5, 10, 25, or 50 miles, but we would make the best out of the cards we were dealt. At this point, any ideas of a course record were completely out the window. Also, I knew that Sumner Button was in the race and though I had just raced her at the Mt Bachelor 50k, I knew that this time I was in no shape to compete with her, so the plan was to run completely comfortably and just see how things went. Though we landed in the brilliant sunshine of Redmond on Thursday afternoon, central Oregon was having record low temperatures. My plan was to start the race in a jacket and then take it off at the start of the second loop. I had hand warmers, of course (I have Raynaud’s and my hands can go numb picking out vegetables at the supermarket), and a variety of options depending on the weather. I had the comfort of knowing that my friend Danielle Snyder was going to be in the race with me and right before the start, I saw Bellingham friend and Mt. Baker Ultra Race Director Dan Probst. It always calms my nerves knowing that familiar faces are nearby. Janessa and Trevor sent us on our way at promptly 7:00am. After the aid station around 15 miles, I joined a little group with Seattle friend Chris Barry. Shortly after, Corinne Sayler joined us. She would turn out to be my trail angel, but neither of us knew it at the time. I felt like I had to pee at 10 miles, but I was afraid to stop because I didn’t want to lose the nice company that I was in. I decided to hold it until the mile 21 aid station and peed while everyone refilled their water. When I stood up, the tendon behind my knee immediately started hurting. “Great,” I thought. Up until that point I couldn’t even feel the strain in my glute that has been bothering me for months and I wasn’t really having any problems. I just kept praying that my knee wouldn’t get any worse. I finished off the first lap in a little over 4 hours, which felt really controlled and comfortable. I took an Advil to help my knee pain, and other than that, there was no reason that I couldn’t go on. The temperature warmed up enough that I could drop off my jacket, but I held onto my gloves. I fueled the first lap with only gels because that is what I usually do, but my stomach started getting so hungry at just 20 miles. When I stopped half-way, Tad gave me a blueberry bagel from Fred Meyer. It was surprisingly delicious and extremely soft for a day-old bagel which made it perfect to eat while running. The bagel worked so well that when I got to the next aid station at mile 33 I grabbed a peanut butter and jelly sandwich in each hand. I just had to laugh out loud because this was a first for me. I have never eaten sandwiches while racing before. Ultras are so weird. My new friend, Corinne had a goal of 10 hours for her debut 50 miler. She was running the race of her life! We had plenty to talk about as she was from Anacortes (close to Bellingham) and coached by our mutual friend, Krissy Moehl. She and I started the second lap together and we separated ourselves from the rest of the group. If I didn’t have Corinne, I would have been completely alone for 95% of the second lap. Once I entered virgin mileage territory – 34 miles – I started to feel a little tired, but nothing terrible. We hiked most of the climbs as that seemed to provide some relief to my knee pain and chatted about random life events, just enjoying each other’s company and the beautiful day. The top of the first climb…the second time around. I saw Tad at 40 miles when we rolled into aid station #6. He said that Corinne and I were moving really well, closing in on a big bunch of men, and to keep it rolling. I picked up some cookies – another first – and as we headed back out, I tripped, busted my knee, and lost my cookies in the high desert dusty dirt. I quickly gathered them up from the ground, wiped off the dirt as best I could and proceeded to eat them. Ultras are so weird. Those 3 miles took freaking forever and when we finally got to aid #7 at 46 miles, I grabbed some animal crackers out of desperation. My legs were wobbly, and I started to feel strange. Flashbacks to Flegere at the Mont Blanc Marathon where I was pulled by the medical personnel came to me. But we were almost done! Less than 5 miles to go! No big deal, right? Burma Road finally appeared which is a screaming fast, steep downhill mile, 2.5 miles to the finish. When I started the descent, it felt like I was having an out of body experience. I couldn’t feel my arms and legs flailing beside and under me. My brain felt like it was getting knocked around like a ping-pong ball. It became overwhelming enough that I stopped briefly so that Corinne could go by and I could just follow her. When we got to the bottom, I was really losing it. With 1.5 miles to go I told Corinne with certainty that I was going to die. Danielle came sprinting by like she was just getting started (and ended up finishing second female!). She told us to run with her to the finish, but I felt like I needed to curl up on the ground at that point. Bless Corinne’s heart, she kept looking back to see if I was okay. When we got close to the finish she took off and told Tad at the finish line that I wasn’t doing well. Corinne finished her first 50 miler so strong in 8:57 and 3rd female! When I got to the finish, Janessa gave me a high five and a space blanket, Tad gave me my jacket, Trevor gave me hot water to drink and I saw down next to a fire. Oof. We did it. I finished 5th woman in 9:00:33. Full results here. It’s so amazing what our bodies are capable of! In retrospect, I know I was hypothermic (or on the verge of becoming). The same thing happened to me at the 2017 Mont Blanc Marathon. It was 5km to the end of the race, I was hiking, got cold, and then my body just shut down. A huge lesson learned from Saturday is that I always need to carry a jacket with me in these long races. We do that for every mountain training run, why wouldn’t the same rule apply to races? I was so cold that we went straight back to the AirBnb, and I sat in the shower for a good 30 minutes trying to get warmed up. In my haste to leave, I forgot to pick up my finishers medal which is this cool 6-inch round metal cut-out. Typically, I don’t care about that kind of thing, but I just ran 51 freaking miles! You better believe I want my finishers medal. I went back the next morning while the half marathon was going on and picked it up. It’s already hanging up on the wall in front of my desk. The aftermath: I have been lying in bed feeling extremely nauseous with no appetite at all, but I have been able to keep what foods and liquids I do eat and drink down. My knee is super swollen and bruised from where I fell and the tendons behind it are bruised and so sore it hurts to walk. I will be taking the next 3 weeks completely off to fully heal and hit reset. What a year it has been. Last year was my 50k debut, this year I ran 4 50ks and a 50 miler. I am looking forward to really taking time and appreciating everything that I have had the opportunity and health to do this year before making plans and goals for 2019. Alpine Running race directors, Janessa and Trevor – thank you for making my first 50-mile experience so special. You and your team did an amazing job for all of us out there to be able to do what we love. Thank you so much! Corinne Saylor, my trail angel – thank you for your company, your encouragement and helping me get to the finish line safely. Congratulations on crushing your first 50; I can’t wait for the day you line up at Cascade Crest. Warren Schick – thank you for spending hours of your time to help heal my injuries with your craft of acupuncture. You are so thoughtful, kind and supportive; the Bellingham Community is so lucky to have you. Matthew Pettersen – thank you for all of your skills in helping to make my hamstrings stronger and for being willing to break a sweat while working on all the knots in my body. Chris Lockwood – you have been with me since we got to Bellingham. You have seen the good, the bad, and the ugly and are one of our dearest friends. Thank you for being there for me always. Tad – you have been a saint putting up with me the past couple months. I know it hasn’t been easy. You are my rock and I love you very much. Friends and family – I am blessed to have too many to list, but please know how much I love you all. Thank you for you unconditional love and support. Thank you to my sponsors, La Sportiva, Terrain Gym, Trail Butter, Native Eyewear, Lily Trotters Compression – you all play a massive role in my life and I wouldn’t be living my dream if not for your support and friendship. What a beautiful day to run for 9 hours.